While there are Wine Wednesdays, Thirsty Thursdays and Sunday Fundays, at Bastille, they have added a new day to the mix: TWOsdays! Beginning Tuesday, November 28th through Tuesday, December 19, Bastille offers couples, weary from the holiday hustle and bustle, an appetizer, two entrees and a choice of dessert for $59. Choices include appetizers like Soupe à l’oignon; Beignets de crevettes; Salade Maison; or Foie gras torchon (Suppl. $9). Entrees offered include Moules frites; Saumon; Onglet à l’échalotte; Confit de canard GF (Suppl. $7) and Coq Au vin. The meal finishes with a choice of one of Chef Michelle’s desserts featuring coupe Glacée; pumpkin crème brulée or a French classic, Profiteroles. Twosdays are a perfect holiday break from the shopping craziness and a great deal for those that deserve just a little gift for themselves. 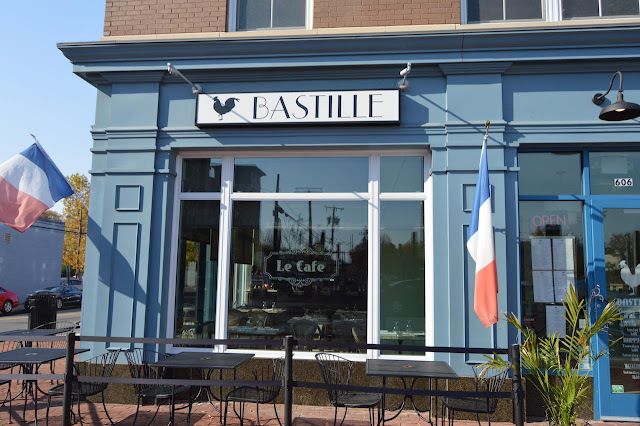 Bastille is open Tuesday through Saturday from 11:30 am until 10 pm and Sunday 11:30 am until 9pm serving brunch, lunch, dinner and all day dining with café and bar menus offered. The restaurant is located in The Asher at 606 N. Fayette Street in Alexandria, VA, just two blocks from the Braddock Metro. For reservations and further information log into www.bastillerestaurant.com or call 703-519-3776.